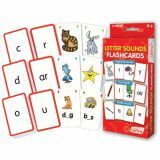 Letter Sound Flash Cards: Beginning sounds, final sounds and middle sounds. 3 flash card sets, 162 cards. Make learning a game with these colorful flash card packs. Each includes activity ideas for solo or group play. Self-checking; answers on back. 56 two-sided cards. 3- 1⁄8" x 5- 1⁄4". Picture cues teach basic rhyming words. Grades K-2. 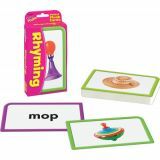 Learning cards are perfect for sorting and classifying and developing memory, observation, and language skills. 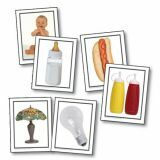 The Things That Go Together learning cards set includes 48 cards (4.25” x 5.5” each) featuring photographs of things that students can match together. The set supports NCTE and NAEYC standards and includes a resource guide and guided questions in English, Spanish, and French. Key Education products are intended to engage and educate young and special learners, as well as assist teachers in building a strong and developmentally appropriate curriculum for these children. The product line—comprised of teacher/parent resource books, photographic learning cards, and other activity- and game-oriented materials—is designed to assist in “Unlocking the Potential in Every Child."